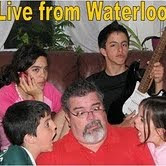 I will leave Toronto at ease now, and bring some pictures taken here in Waterloo. Specifically, at the Zehrs Supermarket on University and Lincoln (one of my favourite spots). I love the fact that one of the cars is a taxi! Voy a dejar a Toronto en paz por una vez, y mostraré fotos sacadas aquí en Waterloo. Específicamente, en el supermercado Zehrs de la esquina de University y Lincoln (uno de mis lugares favoritos). Me divierte mucho que uno de los autos sea un taxi! I probably should, if I knew how to 'move' the posts from one blog to the other (I have at least three more ready to go live)!